You’ve crafted buyer personas, developed content topic clusters and created optimized content for your target audience. You’re ranking well in search and generating more visits and leads than ever, but you’re not seeing an increase in business. What do you do next? If your top-of-the-funnel gains aren’t translating into higher sales, it means there’s a weak spot in your pipeline. Reference your lead conversion funnel to evaluate your sales pipeline and diagnose the problem. Don’t have a lead conversion funnel? Download our ebook, Lead Generation for B2B Technical Audiences, to get started. You could be facing a couple different problems, and possibly struggling with more than one. Today, we’re looking at a low lead-to-MQL (marketing qualified lead) conversion, and one approach to solve this pipeline blockage. 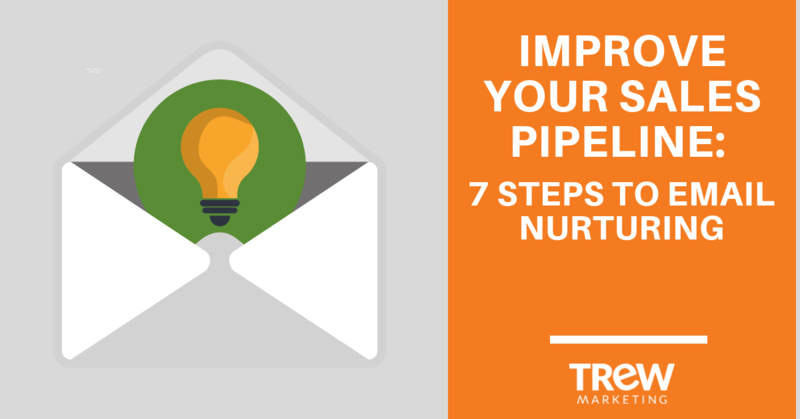 Email nurturing is taking leads already in your database and sending them targeted content via email to move them down the funnel. By sending strategic emails aimed at the lead’s particular needs or persona, you’re increasing the odds that the lead engages with your brand further and becomes qualified for sales outreach. Email nurturing with content also keeps your brand top-of-mind, maintains consistent communication with the lead and establishes your brand as an industry expert. One very important point to note with email nurturing: for any nurture to be successful, it must be targeted to the needs of the people receiving it and it must be genuinely helpful. A sales-focused nurture will not be nearly as successful as an informative nurture at this stage of the funnel. With that, let’s get started! Follow the steps below to create an email nurture aimed at improving lead-to-MQL conversions. An email nurture can be based on persona, service area of interest or a specific content download. Define your ideal group and determine the qualities these leads share. Do you close more deals with one persona over another? Does a new, popular resource correlate to a specific service offering? The audience you select will determine the resources you include in each email, the calls-to-action (CTA) and even the tone/wording of the emails themselves. At this point, you should also consider whether there is anyone in this group you need to exclude. For instance, if I want to target persona A, I’ll want to exclude leads that sales has permanently ruled out (e.g. competitors, bad fits, employees/partners). How long will you wait between emails? Should a contact be removed from the nurture if he/she takes a certain action (e.g. clicking a link, downloading a resource, scheduling a meeting)? Use your answers to develop the framework for your email nurture before moving on to content. As a baseline, most nurtures send 3-5 emails at a 3 day to one week interval. Based on your audience preferences, length of sales cycle and warmth of leads, this may be significantly shorter or longer. Using the framework, assign a content topic and CTA to each email. It helps to pull in people from different departments (marketing, sales, service delivery, etc.) to get multiple perspectives on the content that will best fit the audience’s needs. Specify the overall topic for the email, salient information to include and one CTA. Although it may be tempting to pack content into an email, limit yourself to one CTA per email to keep it focused and give the recipient a clear next step. When selecting a CTA, don’t limit yourself to existing or new content. Use this email nurture as a chance to brainstorm new, targeted content and to review old content to optimize. Identify what content changes need to be made and what content needs to be created at this stage to complete the email nurture. Work through the necessary content changes and create the content identified in the previous step. Once all the included resource and CTAs are complete, you can finally move on to the email creation. Write for your intended recipient, using the tone and language that speaks to him/her. Be succinct: keep emails short and to the point. Include a clear CTA in the email so the recipient knows the next action to take. Have other coworkers, including those in other departments that are familiar with the target audience, read over the emails and provide feedback. You’re ready to build out the email nurture! Head into your marketing automation tool and design the emails, including images and CTA buttons. Once the emails are set, build a workflow to send the emails at designated intervals to the defined audience. Keep audience exclusions, workflow goals and rules for contact removals in mind when building the automation. Once the nurture is built out, test it and launch it to your audience! Launching the workflow is not the end of this process. After the workflow has run fully through one time, review your email metrics and goal success rate. Identify any low-performing emails and diagnose the problem. The solution may be changing a CTA, swapping a subject line or even removing an email entirely. An email nurture is not static, so don’t be afraid to review and iterate! Looking for more information to patch your pipeline? Download our free ebook, Lead Generation for B2B Technical Audiences.